The most important story within the story was the fight within Sunday’s aerobic fight during the women’s World Cup 10-kilometer classic in Kuusamo, Finland. Each of the seventy starters in the women’s field wore a pink ribbon acknowledging the global fight against breast cancer and their friend, retired U.S. athlete Kikkan Randall. The aerobic fight on the 3.3 k loop in Kuusamo wasn’t well defined until Norway’s Therese Johaug skied through the stadium to begin her second lap. From then on, in her first World Cup race after serving an 18-month ban for failing a drug test, Johaug marked the fastest times at every remaining checkpoint. Her 5.7 second lead at 3.3 k became a 22.5-second margin at the finish where she won in a time of 28:02.5 minutes. Sweden took the next two podium spots: Charlotte Kalla placed second (+22.5), Ebba Andersson third (+32.8). Before her suspension, the thirty-year-old Johaug last won on the World Cup in 2016. In that season-ending 10 k classic pursuit in Canmore, Canada, Johaug won the day and secured her second overall World Cup title. That year, her last full season on the World Cup, she won 17 races, as she podiumed a total of 28 times. The U.S. positioned three skiers in the points. The U.S. Ski Team’s (USST) Sadie Bjornsen placed eighth, finishing 1:10.5 minutes behind Johaug. Jessie Diggins, also of the USST, placed 14th (+1:38.5), with Rosie Brennan (APU) racing to 23rd (+2:02.8). With the ongoing success of the U.S. women’s team, where podiums have been common, a slow start is defined differently than it might have been in the recent past. 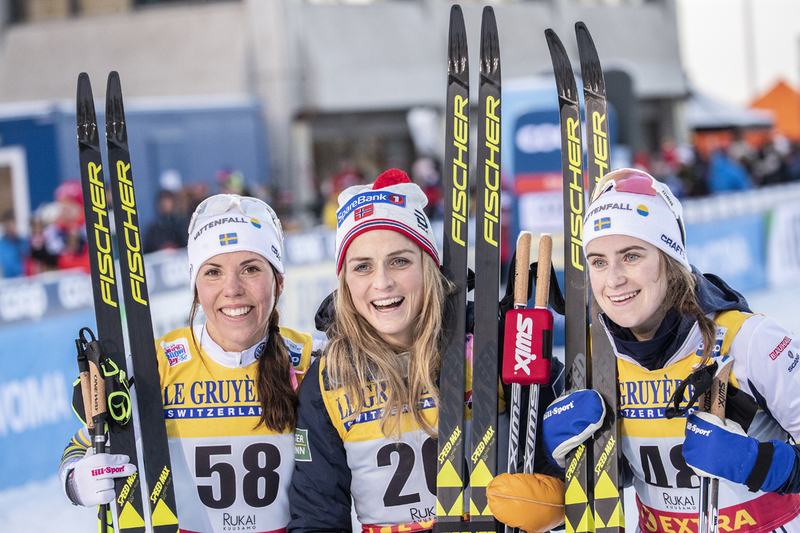 Last year, for example, during the 2017 World Cup opening Ruka Triple, Bjornsen and Sophie Caldwell placed second and eighth respectively in the classic sprint. In the 10 k classic, Jessie Diggins placed 10th after not qualifying in the sprint (she placed 34th), while Ida Sargent was 22nd, Bjornsen 23rd. Bjornsen finished the three-race series in 10th overall, Diggins 12th. Randall posted a 25th overall for that weekend, Brennan, then part of the USST, finished 28th. Collectively, the 2017 opening weekend was solid for many. By that benchmark, the same can be said of 2018’s first World Cup go for the U.S. women. The twenty-nine-year-old Bjornsen comes off an 11th in Saturday’s sprint. In her longer effort on Sunday, Bjornsen capitalized on the always charging Diggins. Bjornsen did chase down her ally and with it motivation to push harder. Over the years, Bjornsen has defined herself as a formidable classic skier on the World Cup. Despite that reality, she explained she modified her striding technique to remain “low” when she becomes fatigued in the race. Closing out another more-than-solid opening weekend for Bjornsen may also have something to do with ski selection. Bjornsen spent time refining her ski fleet during the off-season. When it comes to fixes, Diggins, according to last year’s template, is right where she needs to be. The sky has not fallen. Diggins confirmed she was carrying a big load of training into the opening weekend. Her primary early season objective remains the Tour de Ski. After Diggins and Randall scored their Gold medals in PyeongChang, their lives changed. Diggins remains a sought out motivational speaker, and product endorser. Her obligations as it relates to commitments outside her immediate training and resting have ballooned. She helped secure a World Cup for Minnesota and continues to advocate on behalf of climate change concerns and The Emily Program — an advocacy group focused on eating disorders. By the time the Olympics roll around in February last year, Brennan felt sapped. She was not renominated to the USST following the season but continued her training with Alaska Pacific University. Diagnosed with mono, Brennan rested and recovered. Eventually, she re-tested her race form this past June, by setting a record time in the 2018 Alaska Run for Women. In the points with room to spare, Brennan’s top-25 performance rings a positive note. Her race performance didn’t buckle in her World Cup return. Her pacing and splits were consistent. With 2.3 k remaining during Sunday’s race, Brennan sat in 19th place in a tightly stacked field. Also for the U.S., Sophie Caldwell (USST) finished 43rd (+2:52.3), Caitlin Patterson (CGRP) 46th, (+2:56.8), Ida Sargent (USST) 56th (+3:31.1), and Kaitlynn Miller (CGRP) 61st (+3:55.7). No other North American women were entered in the race. Racing on the World Cup moves to Norway where a three-day series will begin in Lillehammer, Norway next Friday with a freestyle sprint.